Chicken and other types of poultry are versatile, readily available, reasonably priced, and packed full of protein, essential nutrients and vitamins. They are also the number one choice for anyone who is watching their fat and calorie intake but doesn't want to give up meat. 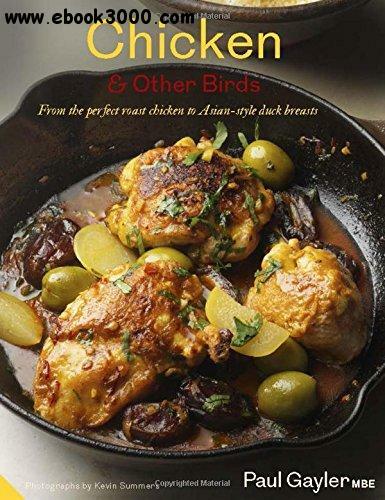 This book brings together over 100 main course dishes that employ the whole range of cooking techniques, and that use the ubiquitous chicken as well as all the less well known birds such as turkey, goose, duck, guinea fowl, poussin, pigeon and quail. In addition, Chicken and Other Birds offers a visual tour of the birds, showing their relative sizes and discussing the differences between them, plus a buying guide a?? what to look for and how much to allow per person a?? followed by tips on storing and handling uncooked poultry, and step-by-step photos and instructions for preparing a bird before cooking (trussing, French trimming, stuffing and jointing), and for carving or jointing a whole cooked bird. The final chapter, 'Perfect Sides and Complements' is a round-up of flavoured butters, marinades, rubs and bastes, stuffings and sauces, chutneys and relishes and, last but not least, the perfect gravy. This beautifully illustrated and comprehensive book is sure to become the classic poultry cookbook that no cook can afford to be without.